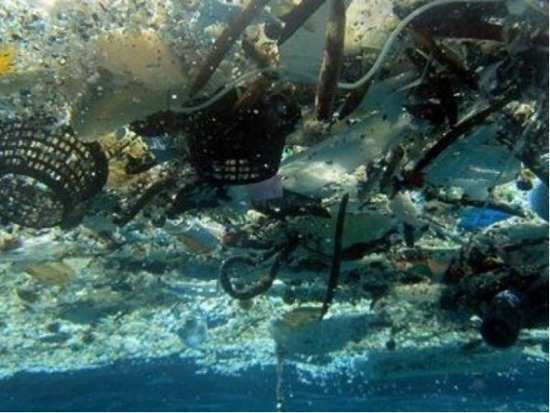 HomeTrendingThe 'floating' island of trash dubbed the Great Pacific Garbage Patch now stretches 600,000 square miles! The Pacific Ocean is being treated like a giant dumpster, but that you'll already knew, right? Well, did you'll also know that the 'floating' patch of garbage has been dubbed the Great Pacific Garbage Patch (GPGP)? And stretches a good 600,000 square miles, according to a study published on Thursday, the 22nd of March, 2018 in the Scientific Reports. It's more than twice the size of Texas (three times the size of France), and it's growing every day. Environmentalists experessed concern in 2016 after a team of researchers surveyed the vortex of trash piling up between California and Hawaii, spotting chunks of plastic glued together measuring more than a yard. "It's a ticking time bomb because the big stuff will crumble down to micro-plastics over the next few decades if we don’t act," Boyan Slat, founder of Ocean Cleanup, a nonprofit that helps remove pollution from the world's oceans, told a leading news portal. "The size of the trash pile has nearly doubled in size since then, containing at least 79,000 tons of plastic. A figure four to sixteen times higher than previously reported," Scientific Reports stated. Researchers gathered 1.2 million samples during a multi-vessel expedition in October 2017, exactly one year after their previous test. Large items such as bottles, ropes, plastic bags and buoys were the most common objects spotted in the pile. Fishing nets had an overwhelming presence, accounting for nearly half of the weight of debris picked up by research vessels. Data from the nets proved more plastic is coming into the ocean than being cleaned up. But scientists didn't realise how fast garbage was piling up. "Historical data from surface net tows indicate that plastic pollution levels are increasing exponentially inside the GPGP, and at a faster rate than in surrounding waters," the report stated. The findings were "depressing to see," Laurent Lebreton, an oceanographer and lead author of the study told a leading daily. “There were things you just wondered how they made it into the ocean," Lebreton said, adding that the group even found a toilet seat discarded into the sea. "There’s clearly an increasing influx of plastic into the garbage patch," he said. Lebreton hopes to find a way to curb plastic waste. “We need a coordinated international effort to rethink and redesign the way we use plastics. The numbers speak for themselves. Things are getting worse and we need to act now," he concluded. 1The 'floating' island of trash dubbed the Great Pacific Garbage Patch now stretches 600,000 square miles!